Originally from Normandy, Chef Lasnon left France in 1994 after working for 4 years in Paris because he wanted to travel. His culinary journeys took him to New Orleans where he met his wife, to London, Cairo, Madeira, Dubai, and three years at the prestigious Ciragan Palace in Istanbul before joining the legendary Hotel Adlon Kempinski in February 2007, arriving with his gastronomic luggage bursting with new ideas and spices, which he likes to use in his cuisine, and the philosophy that "If you are not happy, the food will not be happy." I met with Chef Lasnon in March 2007 during my stay at the hotel, and he describes himself as someone who "wants to go out of the box." He is interested in bioorganic products and would like to do a healthy bio-breakfast. In order for a product to be termed "bioorganic" the soil must be pesticide free for 10 years. 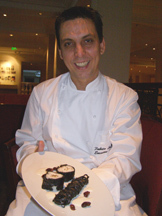 He is a chef who thrives on challenges and creative ideas, and wants to add a little fun for the guests. For ITB (International Travel Berlin, the world travel show held in Berlin each year in March) he decided that attendees needed something elegant and festive when they arrived at the Hotel Adlon Kempinski after a long day of meetings and created a "Caviar and Champagne" treat. Okay, so what is new about Caviar and Champagne? When the "caviar" is actually fruit, in this case, red raspberries broken up to resemble caviar and placed in a champagne glass and left on a silver tray in the guests' rooms with instructions for the guest to go to the mini-bar and get the small bottle of Moët & Chandon, open the bottle, and then pour the champagne over the "caviar." Having tried Chef Lasnon's treat, no wonder it was so well received by the guests. The Hotel Adlon Kempinski officially celebrates its 100th anniversary on October 29, 2007, and I could not help inquiring what Chef Lasnon has in mind for the gala evening. He responded with a twinkle in his eye that perhaps he would create a 100-course menu to celebrate the 100th anniversary! He enjoys using contrasting colors, flavors, and textures, which he expertly incorporates in his intriguing recipe for "Night and Day." The whole dish consists of black (night) and white (day) with the monkfish with olive paste and white foam, and linguini with squid ink cappuccino cream. Chef Lasnon suggests that we should first dry the black olives in a low heat oven (55° C/130° F) for 4 to 6 hours, and then blend them with some olive oil, black pepper, and salt, if needed. We then cover the monkfish filet with the olive paste. We will now proceed with the olive emulsion: Take the black seedless olives and put them in the blender, add a little fish stock (Court bouillon made with the fish bones) and sun-dried tomatoes. Then add olive oil to emulsify the whole mixture to a nice smooth consistency. We now put the monkfish, covered with the black olive paste, into the oven, making sure that from time to time you cover the fish with the paste from the pan. Plating the dish: The angel hair pasta has been already boiled in salted water. On the plate, we put the white pasta. 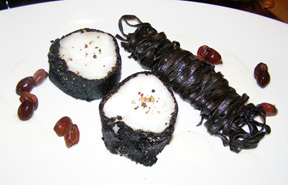 Cut the monkfish filet in pieces of 50 grams (1.76 ounces) so that you can see the black outside and the white of the fish inside. Add the emulsion of black olives, and finish with the reduction of olive paste. Read about the Hotel Adlon Kempinski and the Lorenz Adlon in the Hotels and Resorts, Restaurants, Chefs' Recipes, (German and English) and Spas sections.